Bentornati nel Krup Blog con questo nuovo articolo. Purtroppo, come menzionato nel nostro precedente articolo, quello sui ” 7 MOTIVI PER NON AVERE 7 MOTIVI” non è ancora pronto (ne abbiamo solo 3 al momento); per questo abbiamo deciso di condividere con voi questo matrimonio dello scorso anno a San Benedetto del Tronto. I ragazzi che vedrete ritratti nel trailer e nelle foto si chiamano Silvia e Simone, e più o meno da 10 anni condividono buona parte della loro vita. Probabilmente c’è una cosa che ci ha colpito di più tra le altre: la loro complicità e il modo in cui Simone sembrava prendersi cura di lei. In casi come questo il nostro lavoro non può far altro che semplificarsi; ogni momento sembrava fluire via leggero, un pò come le barche al molo che gentilmente venivano cullate dal ritmo del mare. Il resto è stato fatto da una splendida giornata di sole e un cielo “particolare” che vedrete in seguito. Welcome back in the Krup Blog with this new article. 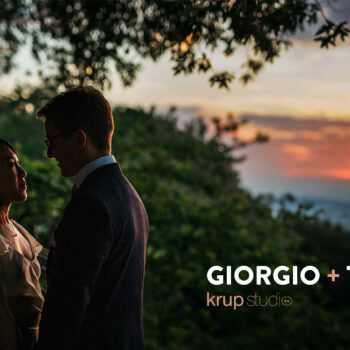 Unluckly, as mentioned in our previous article, the one concerning “7 REASONS WHY YOU DON’T NEED 7 REASONS” is not ready yet (we just have 3 reasons at the moment); so we decided to share with you this wedding we shot last year in San Benedetto del Tronto. The guys you will see in the wedding trailer and in the pictures are Silvia and Simone, and more or less from 10 years they have been sharing a good part of their lives. There is probably one thing that surprised us most, and it is their deep complicity and the lovely way Simone seemed to take care of Silvia. In cases like this, our work is much easyer; every moment seemed to flow away lightly, a bit like the boat at the pier that were gently lulled by the rhythm of the sea. The rest was made by a great sunny day, and a quite strange sky that you will see soon.